Aston Villa ended their nine-match winless league run as they won at Crystal Palace to leave the Eagles two points above the relegation zone. Christian Benteke curled home low into the net from 18 yards, after Scott Dann lost the ball, for Villa's opener and his first goal of the season. The hosts enjoyed a lot of the ball but were let down by a poor final delivery. Andreas Weimann was denied a second by Julian Speroni's block as Villa moved three points above their opponents. Belgian striker Benteke, returning from suspension, was making just his fifth appearance of the season having missed the first three months of the campaign with a ruptured Achilles. And his presence proved key as his strike from Villa's only real chance of the match showed Palace, who had 17 shots, the importance of being clinical. Both sides went into the match anxiously looking over their shoulders, with just two points separating them and the Premier League bottom three. But, while Palace had been buoyed by a win at home to Liverpool and a draw at Swansea in their last two games, Villa were on the back of a nine-match winless run - their worst in the league under boss Paul Lambert. Three successive draws had at least ended a run of six straight defeats but, with just seven goals in 13 matches, the Premier League's lowest scorers desperately needed a result to lift the growing gloom around the club. For a side so short of goals, it was a surprise to many to see their £18m striker Darren Bent loaned out to Brighton, while Roy Keane's midweek departure as Villa's assistant manager has also raised eyebrows. Manchester United loanee Wilfried Zaha, making just his fourth league start of the season for the Eagles, looked like a man with a point to prove on the right wing as the visitors struggled to cope with a high-tempo start. With Yannick Bolasie and Zaha on either flank and Dwight Gayle partnering Marouane Chamakh in attack, an adventurous Palace line-up looked more than capable of causing Villa's defence problems. A poor final ball was letting the hosts down though and Villa, who lost Joe Cole with a hamstring injury early on, took advantage with Christian Benteke's low curling opener after Scott Dann was dispossessed 45 yards from goal. Palace, looking for back-to-back home wins for the first time since April, continued on the front foot after the break but were again let down in the final third as goalkeeper Brad Guzan was left relatively untroubled to allow Villa to hold on to an important win. Crystal Palace manager Neil Warnock: "I think if we had Christian Benteke we would have won comfortably and that is what we are looking for in January. We are just missing that quality at the front. "I can't fault the lads and now we have to do it the difficult way and get points at some tough places. We didn't create enough in the box. "Sometimes you have to make your own luck and we didn't do that, although we huffed and puffed. We are shooting ourselves in the foot." 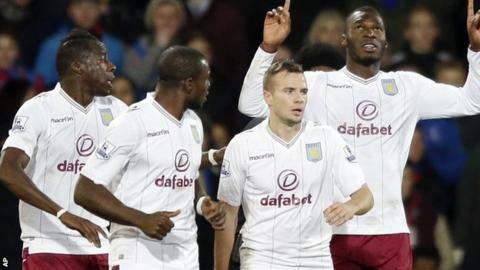 Aston Villa manager Paul Lambert: "We are unbeaten in four and have won at a difficult place. Coming here [and winning] was a massive result, but I thought it was well deserved. "I thought it was a big, big performance. I have played with some world class strikers and Christian Benteke, if he keeps progressing, could be one of the best. The performance was massive for us. "We are up to 12th, we have had a lot of players out, so the progress is there. I understand the disappointment because Aston Villa are a huge, huge football club." Match ends, Crystal Palace 0, Aston Villa 1. Second Half ends, Crystal Palace 0, Aston Villa 1. Offside, Aston Villa. Brad Guzan tries a through ball, but Christian Benteke is caught offside. Andreas Weimann (Aston Villa) is shown the yellow card for hand ball. Hand ball by Andreas Weimann (Aston Villa). Substitution, Aston Villa. Kieran Richardson replaces Tom Cleverley. Substitution, Crystal Palace. Jason Puncheon replaces Martin Kelly. Corner, Crystal Palace. Conceded by Alan Hutton. Aly Cissokho (Aston Villa) wins a free kick in the defensive half. Foul by Fraizer Campbell (Crystal Palace). Christian Benteke (Aston Villa) wins a free kick on the left wing. Foul by Martin Kelly (Crystal Palace). Ciaran Clark (Aston Villa) is shown the yellow card for a bad foul. Foul by Ciaran Clark (Aston Villa). Fraizer Campbell (Crystal Palace) wins a free kick in the attacking half. Yannick Bolasie (Crystal Palace) is shown the yellow card for a bad foul. Alan Hutton (Aston Villa) wins a free kick in the defensive half. Foul by Yannick Bolasie (Crystal Palace). Foul by Gabriel Agbonlahor (Aston Villa). Mile Jedinak (Crystal Palace) wins a free kick in the attacking half. Corner, Crystal Palace. Conceded by Jores Okore. Attempt blocked. James McArthur (Crystal Palace) right footed shot from outside the box is blocked. Assisted by Marouane Chamakh. Foul by Aly Cissokho (Aston Villa). Attempt blocked. Yannick Bolasie (Crystal Palace) right footed shot from outside the box is blocked. Assisted by James McArthur. Dangerous play by Christian Benteke (Aston Villa). Attempt missed. Fraizer Campbell (Crystal Palace) left footed shot from the left side of the box is too high. Delay in match James McArthur (Crystal Palace) because of an injury. Brad Guzan (Aston Villa) wins a free kick in the defensive half. Attempt saved. Andreas Weimann (Aston Villa) left footed shot from the centre of the box is saved in the centre of the goal. Corner, Aston Villa. Conceded by Scott Dann.